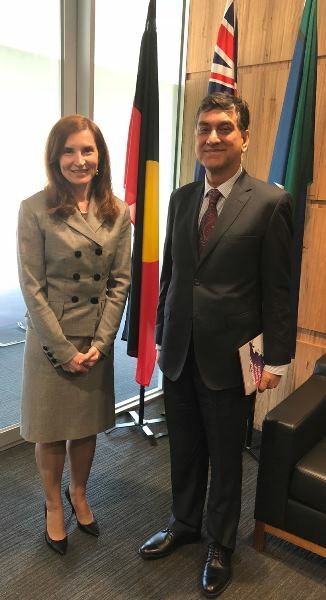 On Tuesday, 9th October 2018, The High Commissioner for Pakistan to Australia His Excellency Mr. Babar Amin met in Melbourne with Ms. Jenny Bloomfield, Director of Victoria State Office of the Department of Foreign Affairs and Trade . During the meeting, High Commissioner discussed with his interlocutor, Pakistan-Australia relations, potential for cooperation at the province-state level and consular matters. The High Commissioner H.E. Babar Amin highlighted trade and investment opportunities Pakistan presented and encouraged Australian businesses to make use of various incentives offered by the government of Pakistan. He stated that there was significant scope of cooperation between Pakistan provinces and Victoria in the fields of education, science and technology, and tourism. He stressed the importance of institutional linkages in this regard. The High Commissioner underscored the contribution of Pakistani diaspora to the multiculturalism and economic development of Australia. 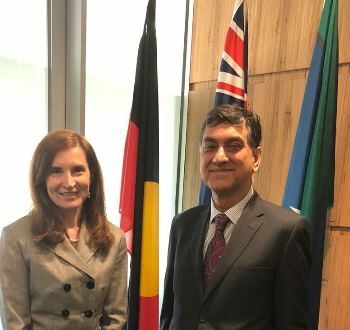 The Ambassador Bloomfield while welcoming High Commissioner Mr. Babar Amin to Melbourne, stated that Australia attached great importance to its relations with Pakistan. She also welcomed the opening of Pakistan’s Consulate General in Melbourne and offered her office’s full support in facilitating its working.